The Fairchild C-123 Provider is an American military transport aircraft designed by Chase Aircraft and then built by Fairchild Aircraft for the U.S. Air Force. In addition to its USAF service, which included later service with the Air Force Reserve and the Air National Guard, it also went on to serve most notably with the U.S. Coast Guard and various air forces in Southeast Asia. During the War in Vietnam, the C-123 was used to deliver supplies, to evacuate the wounded, and also used to spray Agent Orange. 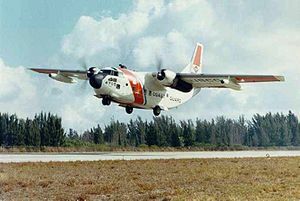 A United States Coast Guard HC-123B Provider from CGAS Miami. A Chase XG-20 glider, which was later converted to the XC-123A prototype. The C-123 Provider was designed originally as an assault glider aircraft for the United States Air Force (USAF) by Chase Aircraft as the XCG-20 (Chase designation MS-8 Avitruc) Two powered variants of the XCG-20 were developed during the early 1950s, as the XC-123 and XC-123A. The only difference between the two was the type of engines used. The XC-123 used two Pratt & Whitney R-2800-23 air-cooled radial piston engines, while the XC-123A was fitted with four General Electric J47-GE-11 turbojets, in two pods. The XC-123A also has the distinction, while only experimental, of being the USAF first jet-powered military transport. While the piston-powered XC-123 was initially well-regarded for tactical transport for its ruggedness and reliability, and its ability to operate from short and unimproved airstrips, the turbojet-powered XC-123A – designed for high-speed transport between USAF bases for critical parts and personnel – was found unable to operate from short and rough airstrips. There was also no practical speed advantage due to the wing and fuselage design, and a drastic reduction in range. Only the one turbojet-powered test and evaluation version was built. By 1953, Henry J. Kaiser purchased a majority share in Chase Aircraft, feeling that after having completed C-119s for Fairchild under contract, he could take control of the impending C-123 contract. Two airframes were completed at Kaiser's Willow Run factory in Ypsilanti, Michigan, before a pricing scandal that led to Kaiser's being told that no further contracts with him would be honored. The C-123 contract was put up for bid, and the two completed airframes scrapped. The contract was finally awarded to Fairchild Engine and Airplane, who assumed production of the former Chase C-123B, a refined version of the XC-123. Before turning production over to Fairchild, Chase originally named their C-123B the AVITRUC but it never stuck. The first recipients of C-123 aircraft were USAF transport units, soon followed by the U.S. Coast Guard (USCG) which used the aircraft for search and rescue (SAR) missions, and even the U.S. Air Force Demonstration Team, the "Thunderbirds," used C-123s for a time as a logistics support aircraft for transporting the team's ground crews and equipment. The type would also be widely exported under various U.S. military assistance programs, directly from USAF stocks. A C-123 was used to transport President John F. Kennedy's limousine during his November, 1963, Texas tour. USAF C-123Bs in the 1950s. The C-123 was nearly ignored by the USAF for service in Vietnam, but a political rivalry with the U.S. Army and the Army's use of the CV-2 Caribou and later pre-production order for the de Havilland Canada C-8 Buffalo, led to a decision to deploy C-123s there. To compete with the well-performing CV-2, the USAF and Fairchild furthered development on the C-123 to allow it to do similar work on short runways. This additional development increased the utility of the aircraft and its variants to allow it to perform a number of unique tasks, including the HC-123B which operated with the USCG fitted with additional radar equipment for search and rescue missions through 1971, and the C-123J which was fitted with retractable skis for operations in Greenland and Alaska on compacted snow runways. A Ranch Hand UC-123B over Vietnam in 1962. A 19th ACS C-123K over the Mekong Delta, 1969. By 1962, the C-123K variant aircraft was evaluated for operations in Southeast Asia and their stellar performance led the Air Force to upgrade 180 of the C-123B aircraft to the new C-123K standard, which featured auxiliary jet pods underneath the wings, and anti-skid brakes. In 1968, the aircraft helped resupply troops in Khe Sanh, Vietnam, during a three-month siege by North Vietnam. A number of C-123s were configured as VIP transports, including General William Westmoreland's White Whale. The C-123 also gained notoriety for its use in "Operation Ranch Hand" defoliation operations in Vietnam. Oddly enough, the USAF had officially chosen not to procure the VC-123C VIP transport, opting instead for the Convair VC-131D. The first C-123s to reach South Vietnam were part of the USAF's Special Aerial Spray Flight, as part of Operation Ranch Hand tasked with defoliating the jungle in order to deny rebels their traditional hiding places. These aircraft began their operations at the end of 1961. Aircraft fitted with spraying equipment were given the U prefix as a role modifier, with the most common types being the UC-123B and the UC-123K. Aircraft configured for this use were the last to see military service, in the control of outbreaks of insect-borne disease. The C-123 was also used as "jump aircraft" for U.S. Army Airborne students located at Lawson Army Airfield, Fort Benning, Georgia in the late 1970s and early 1980s. This aircraft was used in conjunction with the Lockheed C-130 Hercules and Lockheed C-141 Starlifter. 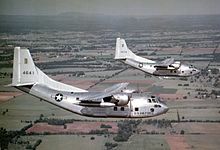 With the end of the Vietnam War, remaining C-123Ks and UC-123Ks were transferred to tactical airlift units of the Air Force Reserve (AFRES) and the Air National Guard (ANG) that were operationally-gained by Tactical Air Command (TAC) before 1975 and Military Airlift Command (MAC) after 1975. The 302nd Tactical Airlift Wing at Rickenbacker AFB (later Rickenbacker ANGB), Ohio, flew the last UC-123Ks Providers in operational service before being converted to the Lockheed C-130 Hercules. Known as the Special Spray Flight, these aircraft were used to control insect-borne diseases, with missions to Alaska, South America, and Guam being among the humanitarian missions performed by this Air Force Reserve unit. The final examples of the C-123 in active U.S. military service were retired from the Air Force Reserve and Air National Guard in the early 1980s. Some airframes were transferred to the Federal Aviation Administration (FAA) for test and evaluation programs while others were transferred to the U.S. Department of Agriculture (USDA) for miscellaneous programs. These aircraft were also retired by the end of the 1990s. In 1954, the YC-123D, formerly the XC-123A prototype, flew in its modified state after being converted by Stroukoff Aircraft. While the most obvious change from the original XC-123A was the switch of engines (to two 3,500 hp (2,600 kW) Wright Turbo Compound R3350-89A radial engines, turning four-blade, thirteen foot Aeroproducts constant-speed fully feathering propellers), the YC-123D also had a boundary layer control system fitted. This system directs air from the engines at high speed over the top of the wing, making the wing act as if the aircraft is flying at a higher airspeed. As a result, the YC-123D had a greatly reduced takeoff and landing distance. Compared to the C-123B, the YC-123D could land in 755 feet instead of 1,200, and takeoff with only 850 ft of runway instead of 1,950, with a 50,000 lb total weight. In 1955, Stroukoff, under contract from the USAF, produced a single YC-123E, designed to be able to take off from any surface, and also equipped with BLC. The new aircraft also featured Stroukoff's Pantobase system, combining a ski system with a sealed fuselage and wing mounted floats, while retaining its normal landing gear. The skis worked both on snow and water, and the system effectively allowed the aircraft to land on water, land, snow or ice. In 1956, the USAF awarded a contract to Fairchild to design an improved version of the C-123 under the designation C-136, but the contract was cancelled before the aircraft was built. At much the same time, the YC-123H was under development, the product of a Fairchild modification program started in 1956 and completed in 1957. A "Jet Augmentation Program" for existing C-123Bs had been initiated in 1955 at the behest of the USAF, and in the YC-123H contract the USAF expanded it to allow the mounting of two pod-mounted General Electric J85 turbojets. The C-123T has recently been revived by a joint venture between the US-based Fleetwings Aircraft Company and the South African company Elmer Group. In 2010, they announced a project to initially remanufacture old airframes for African customers and, where there was demand, to build new aircraft. The airframes would be fitted with new turboprop Rolls-Royce T56-A-15 engines, a glass cockpit and other enhancements. The proposed C-123T would have had a 25,000 lb payload capability, and a take-off run of just over 1,000 ft at 50,000 lb MTOW. Possible applications included maritime patrol, search and rescue, and even use as a gunship, while roll-on packages have already been developed for mid-air refueling and agricultural applications. During the Vietnam War, some C-123s were modified for specialized roles. Most of these modifications were on a one- or two-aircraft level. Only the usage of C-123s as "flare ships" to illuminate targets for fixed wing gunships such as the AC-47 and AC-119G were more numerous. These aircraft, operating under the call-sign Candle were flown by the USAF's 14th Special Operations Wing. US Air Force NC-123K "permanent test" model used over the Ho Chi Minh Trail. It was outfitted with a forward looking infrared system, low light level television, a laser rangefinder, and cluster bomb dispensers. A single C-123B was tested as a possible replacement for the Candle aircraft, with its rear loading ramp removed and replaced with a large box with 28 large lights. The aircraft could continuously light a two-mile circle from an altitude of 12,000 ft. This aircraft, under the provisional designation NC-123B was dropped because the lights, fixed to the aircraft, made it far easier for enemy gunners to track compared to the earlier flare ships. The "Candle" aircraft had an extended life when several UC-123Ks were transferred to Nakhon Phanom Royal Thai Air Force Base in Thailand. During that period, it was used as a flare ship as well as a forward air control (FAC) aircraft. The flare duties were generally used for troops in contact (TIC) while the FAC mission directed air strikes in Laos over the Ho Chi Minh trail. Another NC-123B was used as a radio relay aircraft over the Ho Chi Minh trail, with equipment to read the signals from various sensors on the ground designed to pick up enemy truck activity. Two C-123K aircraft modified in September 1965 under Project Black Spot. The Black Spot aircraft were to fit under the "self-contained night attack capability" that was Operation Shed Light's primary focus and E-Systems of Greenville, Texas was contracted to complete the modifications. These aircraft featured a variety of new sensors including Low Light Level TV (LLLTV), Forward Looking Infrared (FLIR), and a laser rangefinder. The aircraft looked radically different visibly from its transport brethren, as the new equipment required lengthening the nose by over 50 inches. The aircraft also featured an armament system designed to carry BLU-3/B (using the ADU-253/B adapter) or BLU-26/B (using the ADU-272/B adapter) bomblets, or CBU-68/B cluster bombs. The two aircraft, AF Serial Numbers 54-0691 and 54-0698, were first designated NC-123K in 1968 and then redesignated AC-123K in 1969. [N 2] These NC/AC-123Ks were first deployed operationally at Osan AB, South Korea between August and October 1968, and flying in support of operations against North Korean infiltrators approaching by boat. The operations in Korea met with a certain level of success and as a result the NC/AC-123Ks were transferred to South Vietnam in November 1968. The aircraft operated there until January 1969, when they were redeployed to Ubon RTAB, Thailand. The two aircraft were then returned to the United States to Hurlburt Field, Florida in May 1969, where a second round of training occurred. Four crews attended a ground school in Greenville, Texas and returned to Hurlburt where they flew the aircraft for the first time. The fate of the aircraft is still unclear. Sources have missions terminating in early July 1970 and the aircraft flying to the Military Aircraft Storage and Disposition Center (MASDC) "boneyard" at Davis-Monthan AFB, AZ, where they were returned to C-123K standard, then returned to South Vietnam still wearing their camouflage and black undersides for transport duty. However, the official history states that combat operations ceased on 11 May 1969, with no mention of the second deployment. While the second deployment is mentioned in associated documentation, the only dates are of the arrival in Thailand and there is no information as to when they departed or where their destination was. In 1962, the CIA acquired five C-123Bs from USAF for Air America to be used in Laos and Vietnam, and another 5 C-123Bs to be used by Republic of China Air Force (Taiwan) top secret 34th Squadron, a Black Ops units called the "Black Bat", as Flight B section (Flight A section was the two P2V-2U/RB-69A). The five Taiwan C-123Bs were sent to Lockheed Skunk Works for modifications as covert insertion aircraft with "smart" air-to-air jammer, BSTR system to jam the radars of ground anti-aircraft guns, also added a defensive operator's station to operate the jammers on board, with extra fuel in underwing tanks, with 36 Taiwanese crew finished training courses at Pope AFB by November 1962. The five ROCAF/Taiwan/CIA C-123Bs would be used over North Vietnam as low level and nighttime covert airdrop aircraft, under the South Star II agreement, under the guise of Taiwan's national airline, China Airlines, which had "cover story" of operating Vietnamese Air Transport (VIAT) in South Vietnam, that was formerly operated by Air America. The secret outfit was based in Saigon, but would fly out of Da Nang for airdrop missions going into North Vietnam, with some missions lasting 14 hours. On 1 February 1964, the overall control of South Star II was transferred from CIA to Studies and Observations Group (SOG), as part of U.S. Military Assistance Command Vietnam (MACV) in Saigon. The outfit was redesignated as Det. 1 of USAF's 75th Troop Carrier Squadron (TCS), but within SOG it was known as the First Flight Detachment (FFD). In May 1964, under "Project Duck Hook", six more C-123s received extensive modifications by Lockheed Air Service at Ontario, California, equipped with ATIR and BSTR ECM packages, ASN-25 Doppler navigation system, APN-153 terrain-following radar, a console station for radio operator, new HF radio and other radios. These aircraft were issued to the secret Taiwanese Black Bat unit operating in South Vietnam. In October 1964, MACV, CIA and ROCAF/Taiwan signed the South Star III agreement to continue the operation in Vietnam. The six "Duck Hook" C-123Bs were based at Nha Trang Air Base, north of Cam Ranh Bay, officially designated as USAF Det. 12 of 1131 Special Activities Squadron. The "Duck Hook" C-123Bs were updated with RDR-10 weather radar and ARN-131 homing receiver in 1966 in order to perform missions over the Ho Chi Minh trail. All C-123Bs were converted to C-123Ks in 1968, with two wing-mounted turbjets, plus an ECM upgrade with APR-25 radar warning receiver and ALE-1 chaff dispenser. Project "Duck Hook" designation was ultimately changed to "Heavy Hook". The Det. 12 of 1131 Special Activities Squadron unit at Nha Trang received an outstanding unit award from the USAF, for flying 4,000 classified combat and combat support missions from June 1966 to May 1968. In May 1970s, C-123Ks from the "Black Bats" supported the secret U.S. military incursion into Cambodia. In October 1970, flights into Laos began. In March 1972, the SOG was deactivated, and the Southern Star operation ended with four surviving C-123Ks returned to Taiwan. On 1 March 1973, 34th "Black Bat" Squadron of ROCAF/Taiwan was disbanded. On 5 October 1986, a Corporate Air Services C-123 Provider (HPF821, previously N4410F and USAF 54-679, (c/n 20128)) departed San Salvador-Ilopango Airport in El Salvador loaded with 70 AK-47 rifles and 100,000 rounds of ammunition, rocket grenades and other supplies. It flew along the coastline of Nicaragua and entered Nicaraguan airspace near the border with Costa Rica. Nearing San Carlos, the plane descended to 2,500 feet while preparing to drop off its cargo to Contra fighters. While conducting the drop, the C-123 was shot down by a Sandinista soldier, using a SA-7 Grail. CIA pilots Wallace "Buzz" Sawyer and William Cooper were killed in the crash. Loadmaster Eugene Hasenfus parachuted to safety and was taken prisoner. He was later released in December 1986. The Fairchild C-123 that was shot down in Nicaragua remains there. Its sister ship, also a Fairchild C-123 that was purchased by the CIA at the same time as the first one, was then left abandoned at San Jose International Airport for a time and then was purchased for $3,000 and disassembled into 7 pieces and transported via boat to Quepos, Costa Rica and then reassembled and is now the center piece of a beachside cocktail lounge just up the road from Manual Antonio national park. In 2011, a retired Air Force officer, Major Wesley T. Carter, filed a complaint with the Air Force Inspector General alleging that the Air Force knew that UC-123Ks used for spraying Agent Orange in Vietnam remained contaminated and that the Air Force had failed to properly inform subsequent flight crews of the risks following their transfer to the Air Force Reserve at the end of the Vietnam War. In his complaint, Major Carter contends that the Air Force has known since 1994 that the aircraft were contaminated with the defoliant; he cites the fact that when a former C-123 was being prepared for a permanent static display that workers had to use HAZMAT suits and respirators. Additionally, it is asserted that when the aircraft was tested by the Air Force, it contained high levels of the known carcinogen polychlorinated dibenzodioxin, studies since confirmed by the Oregon Health Sciences University and Columbia University's Mailman School of Public Health. The aircraft which were flown from 1972–1982, were assigned to the Air Force Reserve after their service in Vietnam, and used for normal cargo and aeromedical evacuation missions. Air crews accumulated hundreds of flight hours aboard several contaminated aircraft that were often flown with the windows open due to the smell and eye irritation. Memos surfaced showing that Air Force JAG officers recommended keeping the toxicity information, "...within official channels." Further, Major Carter located Air Force reports of dioxin-contaminated aircraft sold abroad, and of one used at the Robins AFB, Georgia Museum of Aviation with public access to the contaminated surfaces of the aircraft. In 2010, due to concerns about dioxin contamination, the Air Force took the unusual step of shredding all the remaining surplus C-123K/UC-123K aircraft and melting the scraps into ingots for disposal. On 9 June 2011, the Secretary of the U.S. Air Force's Inspector General rejected Carter's complaints, and in a subsequent message explained, "Unfortunately, we do not have the ability to identify or notify the individuals in the categories you mention" when asked if the military would alert the aircrews regarding their exposure to dioxin. On 18 June 2011, the veterans' complaint was accepted with the Department of Defense Inspector General, adding the request that the UC-123K aircraft themselves be designated by the Secretary of Defense as "Agent Orange Exposure Sites". In December 2011, the U.S. Department of Veterans Affairs posted two notices of its decision that, while the post-Vietnam aircraft "may" have been contaminated, the aircrews were "unlikely" to have suffered exposure to dioxin. In an unusual response, the U.S. Center for Toxic Substance and Disease Registry quickly countered the VA position on 25 January 2012 with a statement by their Deputy Director concluding that aircrews and maintenance personnel most likely were exposed well beyond military and government surface-wipe screening levels. In November 2011, the USAF School of Aerospace Medicine began its own investigation into lingering C-123 contamination. In April 2012, the USAF School of Aerospace Medicine released its review of the C-123 Agent Orange exposure issue and reported their researchers were unable to determine the degree of exposure, if any, which aircrews may have had aboard the contaminated aircraft in the period 1972–1982. Their report was, in turn, challenged by university-based experts Richard Clapp and Jeannie Stellman, both of whom continue to assert contaminated aircraft exposed the aircrews as well as aerial port and maintenance veterans. As of August 2012, the U.S. Department of Veterans Affairs has denied service-connection (the linking of a veteran's illness to military service) to every application for medical benefits. In September 2012, Thomas Murphy, Director of VA Compensation Services, wrote that TCDD (the well-known toxic component of Agent Orange) has not been shown to cause harm to humans in his denial of one veteran's application. On 25 November 2012, a committee of scientists and physicians, chaired by Jeanne Stellman, informed the VA Under Secretary for Benefits Allison Hickey that the VA's scientific conclusions regarding the C-123 situation were ill-founded and called on the VA to involve outside experts in a re-evaluation. In a subsequent telecon, Deputy Chief Consultant Dr. T. Walters informed veterans no C-123 exposure claims would be permitted to be approved, the VA forming a denial basis around redefining the word "exposure" to include bioavailability. No bioavailability equals no exposure, and thus no exposure claims permitted and indeed, since veterans began learning of the contamination of the C-123 fleet, no exposure claims have been approved other than via appeal to the VA Board of Correction. Veterans have cited the 8 May 2001 Federal Register, page 23166, and the 31 August 2010 Federal Register, page 5320 5, each of which state:carried the VA statement: '"Finally, we wish to make clear that the presumptions of service connection provided by this rule will apply to any veteran who was exposed during service to the herbicides used in Vietnam, even if exposure occurred outside of Vietnam. A veteran who is not presumed to have been exposed to herbicides, but who is shown by evidence to have been exposed, is eligible for the presumption of service connection for the diseases listed in § 3.309(e)." In August 2013, the Department of Veteran's Affairs approved the disability claim of Lt. Col. Paul Bailey. This is the first time the VA has recognized a crew member's claim related to Agent Orange exposure while flying planes after the Vietnam War. The legal questions attracted significant attention from veterans' advocates, and the National Veterans Legal Services Project and the Yale Law School Veterans Legal Clinic published a comprehensive legal analysis]. Exposure was confirmed as the single requirement upon veterans to prove for meeting Agent Orange disability claim requirements, and Yale Law detailed the exhaustive list of proofs establishing the veterans' exposure over the decade of post-Vietnam service of the former Agent Orange aircraft. Besides the legal analysis, Yale's purpose was that their finding be useful for all C-123 veterans in submitting disability claims to the Department of Veterans Affairs. Air Force Reserves flew about 34 dioxin-contaminated transport aircraft, 1971–1982. VA denies benefits, claiming dioxin was bound in “non-available dried residue. We used limited available sampling data and 3 methods to model dioxin exposure. Estimated dermal–oral exposure exceeded US EPA standards for certain personnel. Estimated airborne contamination exceeded the only available standard (Germany). In response to developing scientific challenges to its position refusing C-123 veterans' exposure claims, on March 10, 2014 VA began revising their web pages to include reference to the submission of a special C-123 study project for the Institute of Medicine. First promised the C-123 veterans in 2012, this study directs IOM to consider medical implications of their exposures. The results were published by the IOM on 9 January 2015, solidly confirming the post-Vietnam veterans' herbicide exposures, and faulting the 2012 USAF C-123 Consultative Letter which had relied on incorrect application of a formula in determining toxicity. Under Secretary Hickey assured veterans that VA would abide by the IOM findings, and VA immediately formed a committee to address its next step as C-123 veterans are brought into the VA health care system. Two prototype all-metal troop transport gliders built by Chase Aircraft, later designated the XG-20, one became the XC-123, the other the XC-123A. Former XG-20 fitted with two 2,200 hp R-2800-23 engines. Former XG-20 fitted with four J47-GE-11 turbojets in pairs (of the type used by the B-36 and B-47) under wings. Production model based on the XC-123 with two 2300 hp R-2800-99W engines with accommodation for 61 troops or 50 stretchers, five built by Chase and 302 build by Fairchild Aircraft. C-123Bs modified for defoliation and crop destruction duties. Executive transport version of the jet-powered XC-123A, not built. One aircraft built by Stroukoff with boundary layer control system for improved STOL performance. One aircraft built by Stroukoff with modified fin and rudder, modified fuselage bottom (called Pantobase) and pontoon floats to allow operation from water, sand, snow or ice. Prototype with wide track undercarriage and two underwing J85 booster engines. C-123B with two wing tip mounted Fairchild J44-R-3 booster engines, 10 converted. C-123Bs with two underwing J85 booster engines and larger wheels, 183 converted. Two C-123Bs converted for armed nighttime surveillance with special sensors. Proposed upgrade for Royal Thai Air Force C-123Bs including installation of turboprop engines; cancelled after one prototype due to budgetary reasons. C-123Ks converted for Ranch Hand defoliation missions, 34 converted. One C-123K converted as personal transport for General Westmoreland's use in Vietnam. One aircraft built by Stroukoff, as C-123B but fitted with boundary layer control system, tailplane endplates, redesigned landing gear with tandem main wheels. Later designated YC-134A when fitted with Pantobase landing gear. Proposed improved variant; cancelled before any aircraft built. A South Korean C-123K in 1989. 10 October 1958: A C-123B Provider, AF Ser. No. 55-452', en route from Hill AFB, Utah to McChord AFB, Washington, with five USAF Thunderbirds flight crew and 14 maintenance personnel, flew through a flock of birds and crashed into a hillside six miles east of Payette, Idaho, just before 1830, killing all on board. This accident remains the worst loss-of-life in the Thunderbirds team history. 11 December 1965: En route to Tuy Hoa Air Base, a USAF C-123 hit some trees on top of a ridge, causing it to enter a spin and crash. Four American officers and 81 South Vietnamese paratroopers were killed. 16 October 1980: A UC-123K of the Ohio Air National Guard crashed shortly after take off en route home from Fort Sill, Oklahoma to Rickenbacker ANGB, Ohio. Four crew members died on impact, the fifth died later. 6 February 1982: A South Korean Air Force C-123 crashed into a volcano while on approach to Jeju International Airport, killing all 53 people on board. 1 June 1982: A South Korean Air Force C-123 crashed into Mt. Choenggye, killing all 53 people on board. 1 August 2010: The aircraft used for flying scenes in the movie Con Air, C-123K, former AF Ser. No. 54-0709, FAA registration N709RR (cn: 20158), crashed in Denali National Park while performing a cargo flight for All West Freight. All three crew members died. A C-123K on display at Air Mobility Command Museum at Dover AFB. 54-0555 – Royal Thai Air Force Museum, Don Muang AFB. 54-0610 – Hill Aerospace Museum, Hill AFB, Utah, C-123K (on loan from NMUSAF). 54-0612 – March ARB, California, March Field Air Museum, C-123K (on loan from NMUSAF). 54-0633 – Robins AFB, Georgia, Museum of Aviation, C-123B (on loan from NMUSAF). 54-0658 – Dover AFB, Delaware, Air Mobility Command Museum, C-123K (on loan from NMUSAF). 54-0663 – El Avion restaurant in Hotel Costa Verde, Costa Rica has the twin of the CIA-operated aircraft downed by the Sandinista forces over Nicaragua in 1986. The aircraft has been converted into a bar. 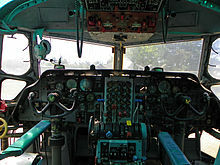 54-0664 – Air Heritage Museum in Beaver Falls, Pennsylvania; this museum's C-123K, nicknamed "ThunderPig," is operational and available for air shows. 54-0674 – Air America Foundation, Inc., owns a C-123K, housed at Space Coast Regional Airport, Titusville, Florida. 54-0683 – Air Force Flight Test Museum, California, sitting alongside a C-119 Flying Boxcar on an unused runway south of the air base. This aircraft was auctioned off in early 2016. 54-0695 – Mid-America Transportation and Aviation Museum, Sioux City, Iowa. 55-4507 – Travis AFB, California, Travis Air Museum, C-123K (on loan from NMUSAF). 55-4512 – Castle Airport (former Castle AFB), California, Castle Air Museum, C-123K (on loan from NMUSAF). 56-4362 – National Museum of the United States Air Force, Wright-Patterson AFB, Ohio, C-123K (Patches, former Ranch Hand aircraft). 56-4375 – Ilopango International Airport, El Salvador, C-123K with serial FAS-122 is on static display, this is one of the original aircraft provided by the United States Air Force to the Salvadorean Air Force during the Salvadoran Civil War. When was in service with the USAF, it was used, by General William Westmoreland, during the Vietnam War conflict, back then was called "The White Whale" VC-123B 56-4375 (AF 56-4375) which were used as VIP transports. UNKNOWN – SpringHill Camps, Evart, Michigan. This C-123K has been repurposed as a camp cabin for year-round use. Several other examples of C-123s remain in an active flying status, operated by private owners in the United States or by various air forces worldwide. A C-123K (54-709), N709RR (since destroyed in a crash in 2010) was prominently featured in the action film Con Air (1997); other C-123s appeared in The Living Daylights (1987), Air America (1990), and Operation Dumbo Drop (1995), none of which were used in Operation Ranch Hand. ^ The DC-3/C-47 family has operated as a glider and under turboprop power, but not under jet power. ^ a b Gunston 1980, p. 170. ^ a b Andrade 1979, p. 87. ^ Rolfe, Douglas and Alexis Dawydoff. Airplanes Of The World. New York: Simon & Schuster, 1962. ^ Gunston 1977, p. 164. ^ "Military transports: Fairchild C-123 Provider." Flight, 5 November 1954, p. 682. ^ Gunston 1980, p. 171. ^ "Fairchild C-123 Provider." National Museum of the United States Air Force. Retrieved: 14 July 2017. ^ "C-123." theaviationzone.com. Retrieved: 10 August 2010. ^ Parsch, Andreas. ""Missing" USAF/DOD Aircraft Designations." designation-systems.net, 2009. Retrieved: 29 October 2010. ^ "Sturdy Provider for Africa." Jane's IHS, 2010 via Africa Aerospace and Defence Exhibition News, 21 September 2010. ^ a b Smith undated, p. VI. ^ Smith undated, p. 6. ^ a b Davis 1982, p. 50. ^ Smith undated, pp. 7, 32. ^ Parsch, Andreas. "AAU/AAK to AVU/AVK – Equipment Listing." designation-systems.net, 31 August 2007. Retrieved: 29 October 2010. ^ Boerschig 1969, p. 5. ^ a b Pocock, Chris. The Black Bats: CIA Spy Flights Over China From Taiwan, 1951–1969. Atglen, Pennsylvania: Schiffer Publishing, 2010. ISBN 978-0-7643-3513-6. ^ Omang, Joanne and George C. Wilson. "Questions About Plane's Origins Grow." Washington Post, 9 October 1986, pp. A-1, A-32. ^ Lednicer, David. "Intrusions, Overflights, Shootdowns and Defections During the Cold War and Thereafter." David Lednicer. Retrieved: 24 September 2011. ^ Philpott, Tom. "Military Update: Complaint alleges Agent Orange risks ignored." The Gazette, 31 May 2011. ^ "DOD IG Complaint #02301." Secretary of Defense, Department of Defense. ^ Sinks, Dr. T. (Deputy Director). "Official letter." Agency for Toxic Substances & Disease Registry, 26 January 2012. ^ Philpott, Tom. "UC-123K PILOT WINS AGENT ORANGE CLAIM." www.military.com, 14 August 2013. ^ "Jet Power Troop Transport." Popular Science, July 1951, photo bottom of p. 81. ^ Fairchild Hiller advert, Air Force and Space Digest, Washington, D.C., January 1967, Volume 50, Number 1, pages 12–13. ^ "Keepin 'em Flying..." www.Check-Six.com. Retrieved 13 May 2013. ^ "Accident Description: Fairchild UC-123K Provider, 16 October 198." Aviation Safety Network. Retrieved: 18 December 2011. ^ "Four killed in crash of plane." The Victoria Advocate, 14 October 1980. Retrieved: 18 December 2011. ^ Ranter, Harro. "ASN Aircraft accident Fairchild C-123J Provider registration unknown Jeju (Cheju) International Airport (CJU)". aviation-safety.net. ^ Ranter, Harro. "ASN Aircraft accident Fairchild C-123J Provider 56-4391 Seoul-Seongnam Air Base (SSN)". aviation-safety.net. ^ "Authorities identify victims of Alaska Con-air movie plane crash." Archived 2010-08-06 at the Wayback Machine wireupdate.com. Retrieved: 10 August 2010. ^ "Outdoor display." Archived 2012-11-22 at the Wayback Machine Royal Thai Air Force Museum. Retrieved: 18 December 2012. ^ "Provider/54-0580". Pima Air and Space Museum. Pima Air and Space Museum. Retrieved 20 April 2019. ^ "Provider/54-0593". Warbird Registry. Warbird Resource Group. Retrieved 20 April 2015. ^ "C-123K Provider." Archived 2012-12-15 at the Wayback Machine Hill Aerospace Museum. Retrieved: 18 December 2012. ^ "Fairchild C-123K Provider." Archived 2012-12-13 at the Wayback Machine March Field Air Museum. Retrieved: 18 December 2012. ^ "Provider/54-0629". Warbird Registry. Warbirds Resource Group. Retrieved 20 April 2015. ^ "Fairchild C-123K Provider." Archived 2012-02-24 at the Wayback Machine Museum of Aviation. Retrieved: 18 December 2012. ^ "C-123K Provider." Air Mobility Command Museum. Retrieved: 18 December 2012. ^ "C-123K." Air Heritage Museum. Retrieved: 16 June 2012. ^ "Our Aircraft." Air America Foundation. Retrieved: 18 December 2012. ^ "Scrap Aircraft." Government Services Administration. Retrieved: 6 May 2017. ^ Burrish, Sam. "Fairchild C-123 will centerpiece museum". SiouxCityJournal.com. Sioux City Journal. Retrieved 20 April 2015. ^ "Outdoor exhibits: Fairchild C-123K Provider." Jimmy Doolittle Air and Space Museum Foundation. Retrieved: 18 December 2012. ^ "Fairchild C-123K Provider." Archived 2013-01-06 at the Wayback Machine Castle Air Museum. Retrieved: 18 December 2012. ^ van der Voet, Aad. "C-123 Providers starring in "Con Air"". Old Wings. Retrieved 20 April 2015. ^ "Fairchild C-123K Provider." National Museum of the U.S. Air Force. Retrieved: 29 August 2015. ^ "C-123 Survivors From Operation Ranch Hand Vietnam". ABOUT OPERATION RANCH HAND VIETNAM SOUTHEAST ASIA 1961–1971. Retrieved 19 April 2015. ^ "Fairchild C-123 Provider Census". Oldprops. Retrieved 20 April 2015. ^ Green 1967, pp. 214–215. ^ Taylor 1969, pp. 323–324. Andrade, John. U.S. Military Aircraft Designations and Serials since 1909. Leichester, UK: Midland Counties Publications, 1979. ISBN 0-904597-22-9. Boerschig Jr, Charles A. Black Spot Special Activities Report. Ubon, Thailand: Black Spot Task Force, 1969. Davis, Larry. Gunships: A Pictorial History of Spooky. Carrollton, Texas: Squadron/Signal Publications, 1982. Green, William. The Observer's Basic Book of Aircraft: Military. London: Frederic Warne, 1967. Gunston, Bill. The Encyclopedia of the World Air Power. New York: Crescent Books, 1980. ISBN 0-517-53754-0. Gunston, Bill, ed. The Illustrated Encyclopedia of Commercial Aircraft. New York: Exeter Books, 1980. ISBN 978-0-89673-077-9. Halliday, John T. Flying Through Midnight. London: New Scribner/Lisa Drew Book, 2007. ISBN 978-0-7432-7488-3. The Illustrated Encyclopedia of the World's Modern Military Aircraft. London: Salamander Books, 1977. ISBN 0-86101-010-8. Smith, C.M. History of the Black Spot Task Force, 29 July 1968–11 May 1969. Eglin Air Force Base, Florida: Black Spot Task Force, undated. Wikimedia Commons has media related to Fairchild C-123 Provider.